Taiwan's Leader Says Threat Of Chinese Invasion "Growing Every Day"
President Trump's at times warm, at times contentious relationship with his Chinese counterpart has been an exercise in cognitive dissonance that's reflective of a broader truth about the relationship between the world's two largest economies. The veneer of economic cooperation belies deeper military tensions as China's expansionist military aims threaten US security in the Pacific. Just last week, the top US Navy commander in the Pacific warned that China represents the “greatest long-term strategic threat to a free and open Indo-Pacific and to the United States." And the country's insistence on carrying on with its military buildup in the South China Sea, one of the most vital waterways for global trade, has angered the US and nearly all of its neighbors. But while the US public labors under the illusion that a military conflict with the Chinese is only a vague possibility somewhere off in the indeterminate future, for the island of Taiwan, China's increasing muscular military presence in the region is a daily threat that requires 24/7 vigilance, according to CNN. As she struggles with waning poll numbers ahead of an election later this year, Taiwan's pro-independence leader Tsai Ing-wen claimed in yet another interview with a western media organization that the world is underestimating the growing threat posed by Beijing. After President Xi claimed during a landmark speech early this year that Taiwan would eventually be re-unified with the mainland in an arrangement similar to that of Hong Kong or Macau - something the Taiwanese people popularly oppose - and threatened any meddling foreign powers (ie the US) who dare to interfere), Tsai said that China crushing Taiwan would be a "setback for global democracy." In response to Xi's threat, Tsai said earlier this year that Taiwan "would never accept" reunification with Beijing. "If it's Taiwan today, people should ask who's next?" she said. "Any country in the region - if it no longer wants to submit to the will of China, they would face similar military threats." "If a vibrant democracy that champions universal values and follows international rules were destroyed by China, it would be a huge setback for global democracy," she said. "With China becoming increasingly strong and ambitious, we are faced with growing threats," Tsai said. In the face of the growing threat (Beijing has carried out military exercises in the Strait of Taiwan to try and intimidate Tsai) the president said that she was strengthening Taiwan's military capabilities in the face of China's rapid modernization, and that Taiwan would be "on alert 24/7" for the first sign of a Chinese strike. "What we are expecting is, after withstanding the first wave of Chinese attacks ourselves, the rest of the world would stand up to exert strong pressure on China," she said. Indeed, the biggest challenge facing Taiwan, in Tsai's view, is its "continued existence." "Our challenge is whether our independent existence, security, prosperity and democracy can be maintained. This is the biggest issue for Taiwan." After the interview, Tsai reiterated to a group of reporters that the island would not accept any deal that "threatens democracy," according to Al Jazeera. 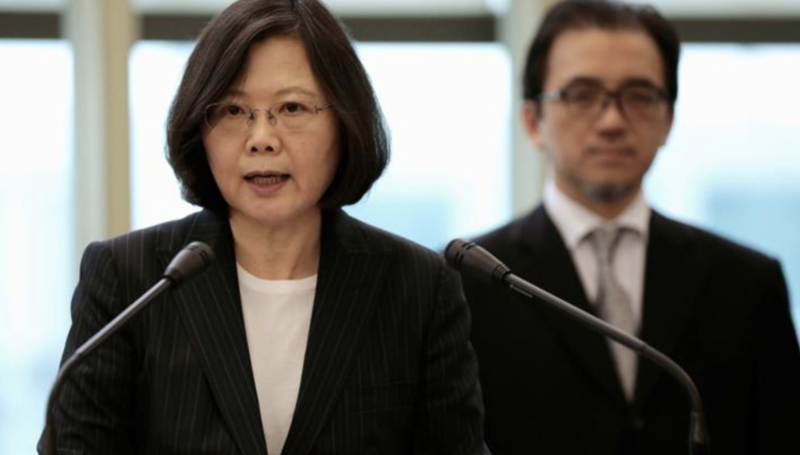 "Taiwan society will not accept any treaty that harms Taiwan's national sovereignty and democracy," Tsai told reporters in Taipei on Wednesday, adding that there would not be real peace unless China ruled out using force to bring Taiwan under its control. Meanwhile, an editor for the Beijing-backed Global Times accused Tsai of warmongering.